I’ve suffered from low self esteem all my life. After a period of illness this year that low self esteem turned into depression. There have been times this year I’ve been sad, dead eyed, weeping, cold in front of my son. He’s two and doesn’t really understand. He asks “what’s wrong Mamma?” as he did this evening when I cried, and he cuddles me and kisses away my tears. It’s heartbreaking and lovely. Ultimately it’s really unfair on him. I feel such guilt at these times, he doesn’t understand. I hope he’s too young to remember the dark days. The dark days are fewer than they used to be. I’m working on my recovery for him and for me. 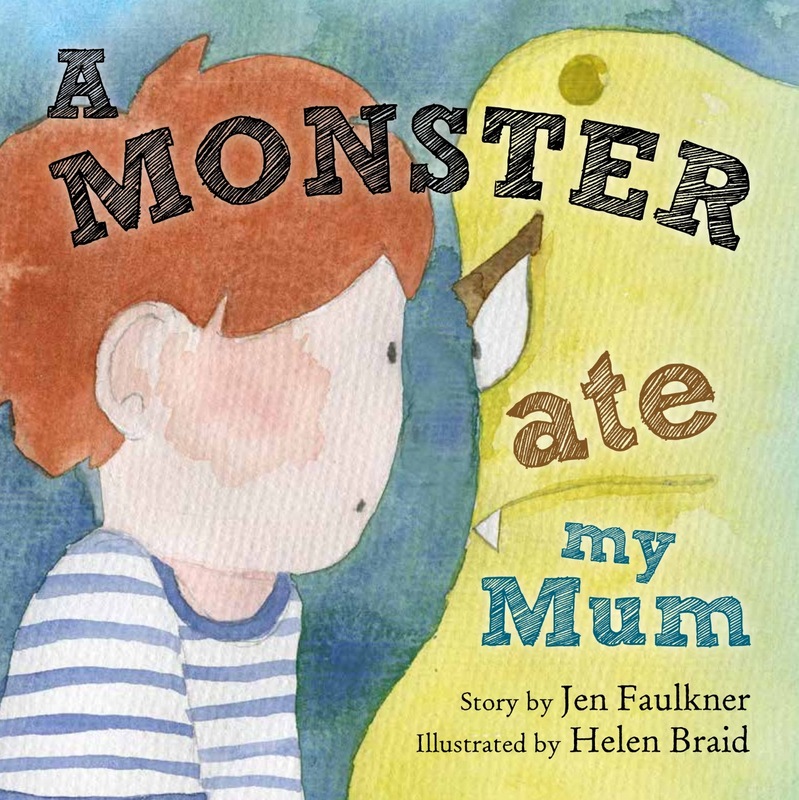 I was mooching around Twitter when I came across mention of a book called A Monster Ate My Mum. It’s a new book aimed at the children of mothers who have post natal depression. To be honest, having read it I think it works for depression generally. I loved the title. It does seem like a monster has eaten me. Snatched me away from my family. Eaten my smile, suppressed my giggles. Made me less human. I had a copy of the ebook to look at and read to my boy. I was immediately struck by the gorgeous illustrations. I fell quite in love with the illustrations by Helen Braid and when I read the book to Splodge and Hodge they loved them too. Author, Jen Faulkner suffered from PND with her third child, she wanted to find a way of explaining her feelings to her older children, so she wrote a poem which this book is now based on. It is beautifully and heartbreakingly written. From my perspective as a parent with mental health issues, this hits all the right notes. It explains things perfectly in an accessible way. Husband Hodge said it made him feel sad because it made him reflect on the impact of my depression on the family. But he agreed that the book is a valuable tool in explaining why Mummy is sad to her little ones. We sat down and read it to Splodge who is just short of his 3rd birthday. He was excited by and engaged by the illustrations and wanted to look at them over and over. We read the story to him a few times. I’m not sure how much he understood, he is still very young, but he did say “Mamma sad” and pointed to the Mummy in the book. I think if this was read to him regularly then he’d understand more. So that’s what we’ll do. It is a beautiful book about a sad subject. I’d definitely recommend this for children who have Mums like me. I feel really strongly about mental health issues. I speak and write frankly about my problems because I’m not ashamed, I have no reason to be ashamed and by speaking out it makes it less of a taboo. Children aren’t stupid, they’re often more astute than adults, by teaching them about the reasons why Mummy is sad can only be a good thing. By not demonising mental health and depression it might make them ask for help if they need it later in life, it might make them more equipped to cope with the problems others face later on, and if it helps them understand there and then that Mummy isn’t like that because of anything they’ve done, then that can only be a good and incredibly positive thing. I really hope this book is picked up and used as a tool for helping families in this situation. I’m quite in love with it and I know it will help us and Splodge. My recovery continues. The dark days are less frequent but they are still there, at least now I can explain that the monster ate my smile. This entry was posted in Books, Children, Mental Health, Review and tagged Book, Depression, pnd, Postpartum depression. Bookmark the permalink.